The 2018 Edelman Trust Barometer was published in early February, an annual report which measures public trust in four key institutions - media, government, NGOs and corporations. Here's our take. According to the report, overall people’s trust in institutions is at an all time low, languishing in a realm of distrust, largely unchanged from January 2017. However there are two distinct trends emerging, divergence of trust across markets and divergence of trust within media. The first significant trend for the last twelve months was a significant divergence between regional markets. According to the report, markets typically move in conjunction with one another when it comes to measurements of public trust in institutions. However, during the last twelve months the United States has witnessed a 37-percentage point drop in trust across all institutions whilst China has simultaneously witnessed a 27 percentage point gain. Within the report the term “media” is a relatively broad term, stating that people now include both the platforms and search engines as well as traditional content within the same category. Somewhat worryingly, media is now the least trusted institution, ranking below government, NGOs and corporates. I remember a time when media was the institution that kept government and corporates in check. However, the downward trend in public trust in media is unsurprising considering the current era of fake news and weaponised social media. Delving into the report in more detail, in fact it appears that these trends are having a detrimental effect on public trust in search and social platforms and positive effect on journalism. 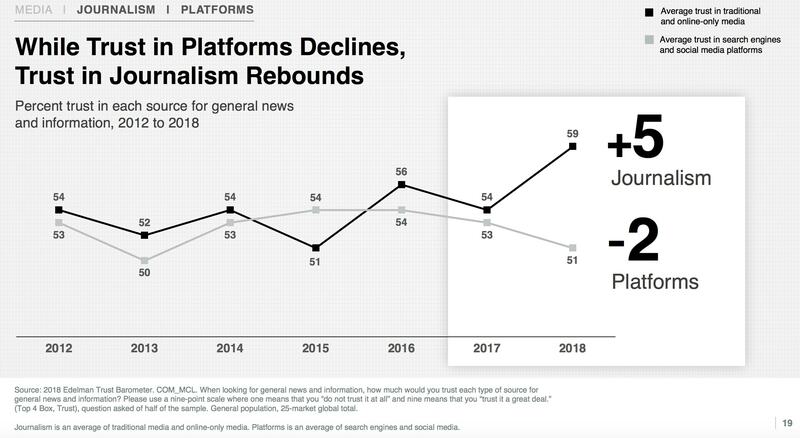 In fact, since 2015, trust in platforms has been trending down roughly -2 points per year to 51%, whereas trust in journalism has made significant trend upwards from 51% to 59% since 2015. 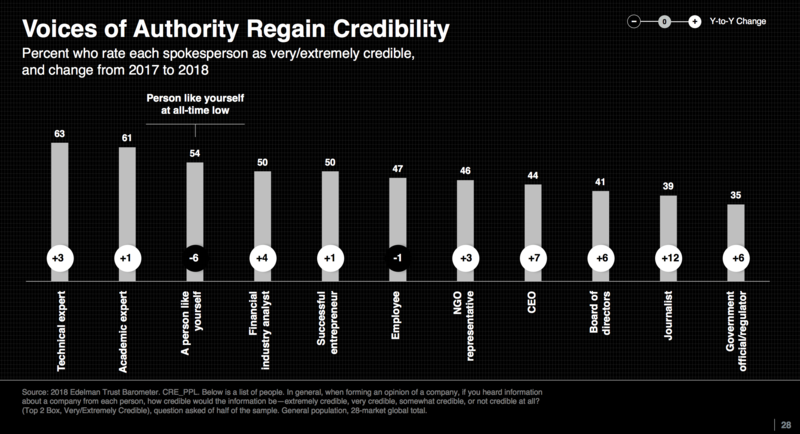 This year journalists saw the most significant increase in trust: there was a double digit increase in the perceived credibility of journalists. This appears to be a strong indication that people are starting to veer back towards trusting the opinion of well-respected, well-known journalists as well as other experts. It seems that we can trust the experts after-all. The respondents to the Edelman Trust Barometer rated Technical (63%) and Academic (61%) experts as very or extremely credible, an increase of 3% and 1% respectively since January 2017. However “a person like yourself” dropped 6% since January 2017 to reach an all time low of 54%. This provides a strong sign that respondents place an increasing amount of trust in credible experts rather than their immediate peers on social media. They are aware how fake news and fake information (nearly 70% cited fake news as worrying) is spreading through social networks and are returning instead to credible sources of information. But crucially they are still looking for individual experts in which they can trust. This, in combination with lack of trust in the general media, makes expert opinion and insight critical. In 2018, people trust business more than media. 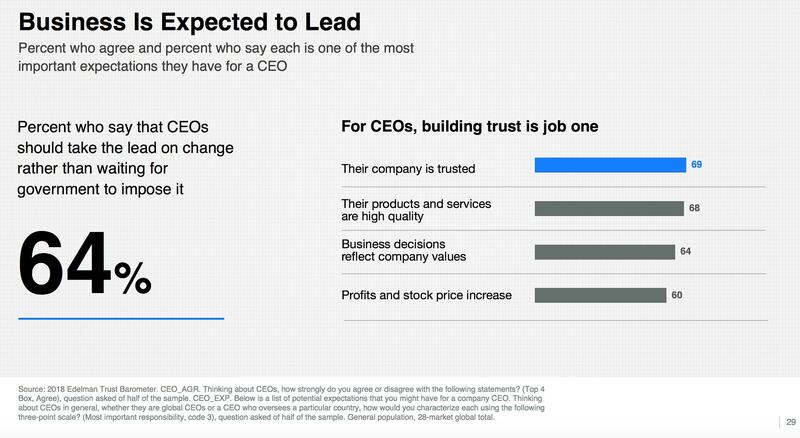 Trust in CEOs increased from 37 to 44% in the last 12 months. This trend represents an opportunity for corporations to fill the gap in trust left by other institutions. Respondents were cited as suggesting that media often has a hidden agenda. The majority of the population are for more regulation of social media platforms in a response to unfettered propagation of extremism and fake news. This is in many ways good news for business. The decline in trust in platforms presents an opportunity for businesses present their point of view, through the use of credible experts. Large corporates are finally paying direct attention to this. Unilever, the world’s second biggest advertiser by marketing spend is threatening to pull its spend from platforms like Facebook and Google if they “create division, foster hate or fail to protect children”. This is big money we are talking here. This advertising spend should in part be redirected towards brand awareness through knowledge sharing and trusted expertise. Sixty four percent of respondents said that they expected business to lead and innovate on change rather than wait for government. These results may well be biased towards the United States, but it is illustrative of the worsening trust in government and the resulting opportunity for business to provide thought-leadership. It’s a clear and direct sign that businesses should place their experts front and centre in reaching their commercial objectives. Overall the results are somewhat reassuring. It’s reassuring to know that the general population, as well as the well-informed public, are learning to spot fake news when they see it, and they are returning towards trusting experts with learned and experiential knowledge. Most interestingly, the report shows a clear opportunity for business to tap into this trend while filling the gap left by declining trust in government and other non-commercial institutions.